UNION CITY, Ga -- The mother of a Union City teenager, killed by a police officer in 2011, demanded that the City's Chief of Police be fired, among other demands. New evidence and testimony has prompted the Fulton County District Attorney and the GBI to re-open her son's case. Freda Waiters has been fighting for her son for three-and-a-half years, and released a lot of her built-up frustration in front of the Union City Council. She demanding a Federal investigation and the arrest of every police officer who played a role in what she called "a cover-up of her sons' murder." 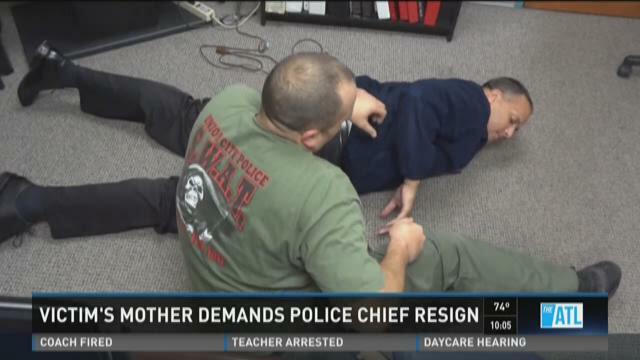 "I want the resignation of your chief of police," Waiters told officials. Her demands were not simple, but forceful. "And the way his murder was covered, like he was just an animal on the street, that's not acceptable." She also asked for the immediate arrest of former Union City police officer Luther Lewis, who shot and killed her son, Ariston on December 14, 2011. The GBI released a video of an interview with Lewis in which he describes why and how he shot Waiters. He described how he had Waiters pinned face-down to the ground with his hands behind his back and put handcuffs on one of his wrists. "My fire holster was sitting right here, I let his hand go, I got my gun out and when I come like this, he grabbed my gun," Lewis explained. "I come up like this and I went with everything I had, bam, bam, and just pushed back in and pulled the trigger twice." A grand jury refused to indict Lewis, but new evidence from a fellow Union City Police Officer, Lewis' supervisor, has prompted the GBI and the District Attorney to take another look at the case. The supervisor said Lewis told him a different story of the shooting and only mentioned a struggle for his gun hours later. Union City Mayor Vince Williams told Waiter's mother the city is contemplating taking action but couldn't specify what action because of legal reasons. "Certainly I'm concerned, have been concerned, and I do want justice to be served," Mayor Williams said. "And we're going to make sure that justice is served." "I'm hopeful, but I'm going to keep praying that more is done," Waiters said.